Meyer will join former USC quarterback Matt Leinart, former USC running back Reggie Bush, and former Notre Dame quarterback Brady Quinn on the show, which will be hosted by Rob Stone. The show will air at 11:00 a.m. in the fall. Stone and Leinart were part of FS1’s studio show last year with former Buckeye running back Robert Smith. For those Buckeye fans who have sworn off ESPN over the years, Fox will now give them an alternative in prepping them for the day’s actions. It wasn’t unexpected for Meyer to return to television, as he did that the first time he retired as well. The move will allow him to stay engaged with the sport, while also likely still maintaining his various roles at Ohio State. 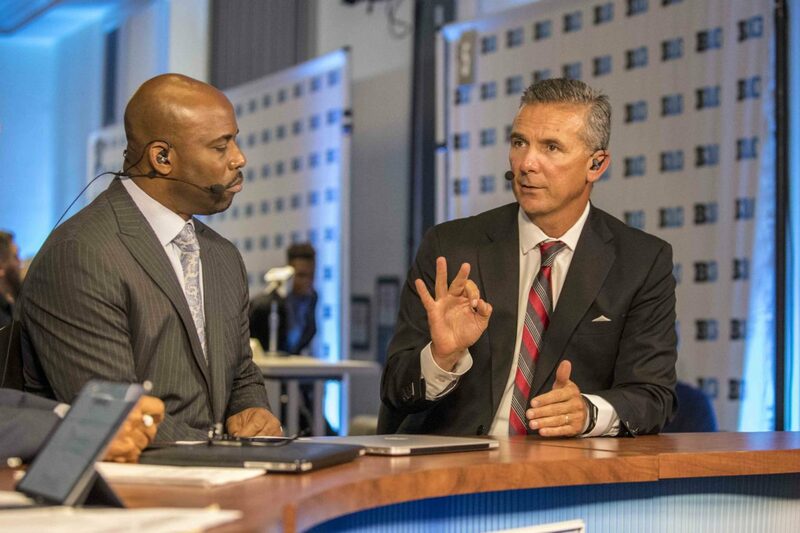 With Fox’s partial ownership of the Big Ten Network, it also wouldn’t be a surprise to see Meyer show up there as well as a guest on their various shows from time to time. Fox has been able to establish widely-watched pregame shows for their NFL and MLB coverage and they are hoping this as-of-yet-unnamed show will be the start of the same kind of footing in college football. According to Marchand, the show will mostly emanate from Fox’s Los Angeles studio, but will also travel from time to time to be at the site of big games that will be shown on Fox that Saturday. NEW YORK – Today, FOX Sports announces plans for its new college football pregame show, featuring some of the biggest names to have played or coached the sport in the last 15 years. Host Rob Stone sits alongside a panel of analysts comprised of three-time national championship coach Urban Meyer, USC legends Reggie Bush and Matt Leinart and record-setting Notre Dame quarterback Brady Quinn. The one-hour show airs each Saturday during the college football season on the FOX broadcast network beginning Week 1. Today’s announcement was made by Mark Silverman, President, FOX Sports National Networks. Meyer and Bush are new additions to FOX Sports, while Quinn spent the last five seasons calling games for the network. Stone and Leinart have contributed to FOX Sports’ college football coverage since 2013. One of the sport’s most successful head coaches, Meyer won three national championships – with Florida in 2006 and 2008, and with Ohio State in 2014. At Utah, he coached quarterback Alex Smith to the No. 1 overall NFL Draft Pick and at Florida, coached Tim Tebow to the 2007 Heisman Trophy. A 17-year Division I head coach, Meyer amassed a 187-32 record (.854 win percentage) at the helms of Bowling Green, Utah, Florida and Ohio State. No stranger to sports television, Meyer worked as a studio analyst for one season with ESPN, in 2011, between positions at Florida and Ohio State. Bush is one of the most prolific running backs in college football history. In three seasons, he was twice named a consensus All-American and the Pac-10 Player of the Year, and following the 2005 season, in which he averaged an impressive 8.7 yards per carry, he was named the Associated Press College Football Player of the Year and won the Walter Camp and Doak Walker awards. An 11-year NFL veteran and Super Bowl champion as a member of the New Orleans Saints, Bush also works as an analyst on NFL Network and has appeared as a guest on multiple FOX Sports studio shows. Quinn joined FOX Sports prior to the 2014 season and called a full schedule of college football games with play-by-play partner Joe Davis since 2015. A four-year starting quarterback at Notre Dame, he set numerous records, led the Fighting Irish to two BCS bowl appearances and finished fourth (2005) and third (2006) in the Heisman Trophy voting. A Heisman Trophy winner and College Football Hall of Famer, Leinart first made appearances on FOX Sports programming in 2013 and moved to the network’s studio desk full-time in 2015. He quarterbacked USC to a BCS title and remains one of the most decorated players in Trojan and college football history. A multi-sport star for FOX Sports, Stone anchors the network’s college football, college basketball and soccer studio coverage and is the lead play-by-play voice of the Go Bowling! Professional Bowlers Association (PBA) Tour on FOX and FS1. A standout on the Colgate soccer pitch, he was recently inducted into the CT Soccer Hall of Fame. FOX Sports will announce additional college football coverage information, including its full list of game broadcasters, at a later date. I’m just happy to hear another program other than EsPN will be on air. Gameday has been extremely lackluster over the past 5-7 years. Unless of course, you’re in the SEC West. Otherwise, if you’re the rest of the football world, or more likely the PAC 12, you’re left in complete boredom. For the past few years, I found the B1G pregame show to be far more football literate, and less on the emotional “kid-with-cancer-and-dog-ran-away-but-kid-overcame-all-odds-to-become-backup-long-snapper” broadcast. Same as last time after quitting at Florida, Urban will make his millions for a year or so on Fox, then he will be back in coaching. I agree, it may be at USC. Hard to change a leopards spots. Glad to hear this. Will look forward to seeing and hearing Urban in a different capacity, but still engaged in the sport he loves. I believe this show will be broadcast from Los Angeles. Urban Meyer will be coaching U$C in 2020. Mark it down.